If you’ve always wanted to know what it feels like to be a rabbit accosted by a pack of wolves, without actually venturing out in the woods, go visit the New Delhi railway station. And if you don’t like the jungle analogy, here’s another. 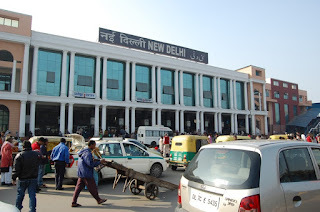 Arriving at the New Delhi Railway station, without booking a registered cab is like being the Delhi CM – master of your own will, but helpless. You can cry hoarse saying “Sir, please don’t trouble us, we just want to go home,” but you won’t be spared by the mafia of cab hounds. As soon as we emerge out of the station around midnight, a battalion of scruffy, smelly men accost us with a volley of, “Sir/Madam, taxi hogi? Kahan Jaana hai?” Suddenly, we are prey to the sundry members of the ‘Kaali-peeli’ cab tribe who menacingly play with their key chains in the index finger. One of them follows us with resolute doggedness, almost forcing us to surrender. “Gurgaon,” we say. “Fine, come with me,” he says. “No, thank you. We’ll take a pre-paid cab,” we say. “You won’t get a pre-paid cab to NCR at this hour,” he says. The moment we engage with him, his scruffy compatriots look at us with contempt. As if we’ve committed a crime by ignoring the rest of the pack. Even before the final amount is settled, this man takes our suitcase and hurriedly heads towards his cab. Now, unless you’ve won the steeple chase at school, you can’t jump across sleeping passengers and their luggage strewn around in a war zone. Try to walk as fast as we can, we can’t match the lanky strides of the man with our suitcase. Moreover, only he knows where his vehicle is parked. Is it any surprise that when we reach his cab, heaving and panting, our suitcase is already shoved in his cab? Rather reluctantly we sit in the cab, kicking ourselves for not booking a registered cab. Once in the cab, an uncomfortable feeling envelops me and my husband. The cab reeks of cheap alcohol and the song playing on the radio does nothing to soothe our nerves. The driver begins to circle Connaught Place instead of driving us home. The man is polite, says nothing, but instinct nudges us to clamber out. “Excuse me, what are you up to?” we ask. “Five minutes, I have to take CNG,” he mumbles. The long queue at the petrol station is a blessing. We open the door and get down the cab. “Give back our luggage,” we say. “We don’t want to travel with you.” The man is polite, but stubborn. “If you didn’t want to come with me, you should’ve said so earlier.” At which point we’ve had it. We pick our suitcase, get down and call a registered cab. While we wait at the petrol station much beyond midnight for our registered cab to arrive, the man stands across the road giving us an ominous stare. There is no violence, no indecent act, no attack, no cheating, and yet the discomfort of going through this agony in the heart of the city makes you wonder if anything has changed in the past twenty years. Regardless whether Congress, BJP or AAP rule the city – chaos rules Delhi after midnight. The last line said it all! We had a similar experience over a decade back when we'd landed in the city from Bangkok. Our driver was drunk and constantly mumbling and he had his young son seated next to him, pleading with him to behave. Felt more sorry for the young boy. Wonder why simple things like safe cabs can't be provided. I was at the station after two years, nothing has changed. Must be a nightmare for them. How annoying it would be in our own city. Glad you had your husband at that hour with you and the guy didn't do anything bad. Donno how HYD is these days. Haven't traveled late night in a long time. I wonder why we cannot have these minor services functioning properly.What is wrong with our DNA ? Simple things Indu. Safe cabs, separate place for passengers who spend the night at the station, clean toilets, food, water.....wonder why it is so difficult. But was the railway station cleaner than before? I had heard/read that some intensive cleaning had taken place at ND railway station? Lol! That Nevers happens!!! Cleaning is not part of anyone's job here. Reminds me of last year when we visited Delhi. The stupid Rajdhani arrived so early from Pathankot that we were at the station before 5 am. Sleepy eyed, we saw these taxi men descend upon us. 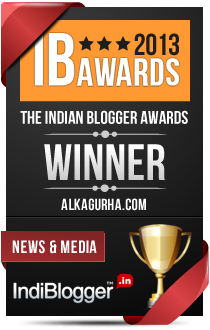 The husband who has lived in Delhi took charge, and gave in to one persistent cabbie. Luckily, there was some crowd at the station. He sprinted with the luggage while I tried to keep up while dragging the sleepy kids. The husband was almost running. He put our luggage in his cab. I was wide awake by then, very wary. Somehow, Delhi gives me the heebie jeebies. The man did nothing indecent but I guess the fear is there. Sad, isn't it? So you know exactly what I experienced. Wonder why we can't provide simple things like safe cabs, clean toilets, verified drivers, hygienic food. And this in the capital city. Oh that is some experience ! Glad you shared this ! Not having been to the railway station in Delhi yet, I can't compare. But we have similar situations at times in Kerala. Bangalore and Chennai though, it's been relatively better. Then again, I try and book a registered cab when possible. Even then, things go awry sometimes. I have lived in Bangalore Sid, nothing beats Delhi. Railway station in Delhi is an extremely alert zone for me. You have to somehow have eyes on your back too. For our commute to Punjab, we have to go there. Thankfully, never in the night but the haggling is equally bad in the morning too. Somebody asked me today, how can you speak so soft despite being in Delhi for five years. In fact, I have lived here for over 20 years in Delhi in parts. Delhi is chaotic, always hyper, showy... and rough. But lovable too. Of course I love Delhi but chaos rules after evening. When compared to Delhi, it is better. The plight of Delhi (and other cities) is saddening. Wonder when those taxi drivers started feeling like we owe them our 'loyalty' for services that they render, which they consider as 'favors'. No ruling party can address and fix human behavior. I wish we Indians had more respect for each other. Then such cases would reduce considerably. Take care and be safe Alka. Agree Vishal, human behavior is beyond politics. However, effective policing can reign in louts who trouble travelers. I am sure the police knows that a rowdy cab mafia rules the station. mumbai railway station cst got thugs,criminals,police joint venture.even if someone takes away your luggage,police will just watch.i was not surprised when kasab entered cst with such ease coz police are such rogues at that station. from that day, i go straight to MERU cabs stand to avoid these thugs.you have a problem with meru cabs drivers too,these guys are very frustrated and they keep telling tales of their suffering in the hands of meru management while driving. meru took contract of taxi stand inside airport premises and they don't allow any other taxi to park. The scene is slightly better in Mumbai but they never shy from doing Nautanki. I faced the same at the airport in Delhi, the cabbie wanted to change the vehicle..lied to him that I represent the Govt in Phoren..lame excuse to be safe but it worked..till hotel he was after my life to do some jhol for him and insisted 50 bucks extra Diwali gift.